I think this yarn represents the weather today. It was a rainy day with a heavy humid sky. 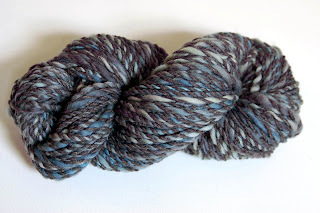 This skien is fairly bulky and is made from a wool single plied with a 50%cotton/50%acrylic dark gray yarn that I recycled from a sweater. I think it is about 8 wpi putting it at a super bulky weight. 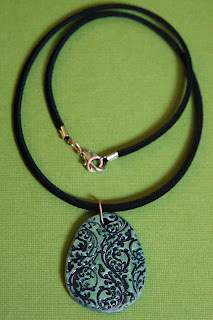 This weekend I also worked on assembling some of my necklaces. I think I have a pretty good system going so far. I'm using copper jump rings with silver toned endings and lobster claws for the suede cords. I can't do too many at a time though, or my hands start to cramp up! Cassie, I really enjoy both pieces, the new yarn ( the color really does mimic the essence of a stormy summer day!) and the necklace is beautiful. I am going to be buying one in the next couple of weeks. Gorgeous. Keep up the lovely work my wonderfully creative friend! Your yarn -- the color and technique is great! I love that you used recycled yarn. By the way, I get my natural dyes from Earthues in Seattle. Hopefully soon, I will have them for sale on my online store!